Hannibal, one of history’s most famous generals, achieved what the Romans thought to be impossible. With a vast army of 30,000 troops, 15,000 horses and 37 war elephants, he crossed the mighty Alps in only 16 days to launch an attack on Rome from the north. For more than 2,000 years, nobody has been able to prove which of the four possible routes Hannibal took across the Alps, and no physical evidence of Hannibal’s army has ever been found…until now. In Secrets of the Dead: Hannibal in the Alps, a team of experts – explorers, archaeologists, and scientists – combine state-of-the-art technology, ancient texts, and a recreation of the route itself to prove conclusively where Hannibal’s army made it across the Alps – and exactly how and where he did it. In his path lay an almost impossible challenge, the mighty Alps. When they arrived at the mountains and they began to climb the full enormity of the task ahead sunk into the soldiers. The ancient writers tell us of the way the soldiers considered these mountains to be almost supernatural. It was only their belief in their daring commander that kept them going. That man was the legend of Carthage - Hannibal Barca. With a force of almost 40,000 soldiers, 9000 cavalry and - most famous of all - 37 elephants. I just find it so improbable elephants passing through here. It was an absolute revelation for us. I felt elated. I had never seen anything like that, I mean, this isn’t what happens. Stop there. It’s really icy; I don’t think we can up there. We have to find another way. To uncover how Hannibal conquered the mountains. The Alps – 80,000 square miles of desolate, hostile mountain terrain – and not a single trace of the extraordinary events that took place here over 2000 years ago. The exact route Hannibal took is one of the most enduring mysteries in history. As the turn of the first millennium approached, the two superpowers of Carthage in North Africa and Rome in Italy were competing on the world stage. Fearing a Roman invasion of Carthage, in 218BC Hannibal drew up plans for a daring, surprise attack. Instead of launching an invasion by sea, he would lead an army across the French Alps, sweep through Italy and march on Rome itself. Historian Eve MacDonald has spent her career on the trail of Hannibal, fascinated by the man himself. Getting inside the minds of people who lived 2000 years ago is so difficult. Even in Roman times just after the events there was controversy over which pass Hannibal took over the Alps. The best existing clues that we have come from ancient writers, recording events two millennia ago. Polybius is our best source by a long way. Polybius wrote about 60 years after Hannibal crossed the Alps. Now, he had access to eye witnesses who were with Hannibal. And that is why he’s probably our most valuable source. In his account of Hannibal’s crossing of the Alps, Polybius mentions many geographical features he encountered along the route. We can use these texts almost as guides – to go into the mountains and try and piece together an accurate account of the route which he took. Eve is joining geologist Bill Mahaney on a mission to finally unravel the mystery of Hannibal’s journey. I’m a mountaineer. In the old days I went climbing, in the later days I did geology, that’s what I do. We got 50cm of different environmental change, fantastic. Bill believes such an enormous army can’t possibly have left no trace at all, and he is determined to find it. For him, discovering the truth about Hannibal’s crossing of the Alps is a lifelong obsession. He was a mountain man; he tackled the mountain experience that absolutely floors me. I’ve been in the mountains with 100, 150 people and it’s pandemonium. People fall in crevasses, people get lost off snow mobiles, people get killed; it’s crazy. And he took 30,000 men, 37 elephants and god knows how many horses across one of the opposing mountains in the world. You have to admit this man was… he knew what he was doing, and he was a man of some genius to be able to pull it off. Hannibal hailed from a family of generals and statesmen, and was raised as a mortal enemy of Rome. Historian Nejib Ben Lazreg is from his homeland, now modern day Tunisia, where Hannibal’s legacy is still very much alive. 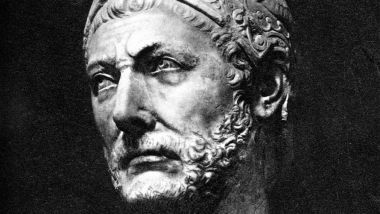 Hannibal was brought up in a family of military figures, like his father Hamilcar Barca who defeated the romans in big battles in Sicily and the mercenaries in Africa when they rebelled against Carthage. Inheriting his father’s strategic brilliance, Hannibal gave Carthage its most glorious hour. He was a very skilled man, and he had the ability to spot the good place where he could trap the enemy. I consider that he’s the greatest figure in our history. No one knows Hannibal’s exact path, but based on these ancient guides four main routes across the Alps are in contention – two northern routes, over the Col du Mont Cenis or the Col du Clapier, one running through the centre and over the Col du Mont Genevre, and a southerly route, the highest and most dangerous of all, over the Col de la Traversette. And it’s this southern pass that Bill believes Hannibal used to march his army into Italy. It’s a route so treacherous that most historians have dismissed it as an impossibility. But now, geologist Bill Mahaney is set on proving it. If that is the Hannibal layer, that’s perfect! Polybius tells us that Hannibal rested his army for a few days at key points along the route. The team hopes they stayed long enough to leave an imprint on the land. Bill believes this open area below the Col de la Traversette could be one of those resting places. Just imagine the troops moving through here would have basically covered a large part of the valley. We probably had 27 to 30,000 troops, 15,000 horses, 37 elephants all milling around in this place for up to five days. They would have devastated this entire area; there wouldn’t be a blade of grass left. And so with that you would expect some evidence to be found in the earth. Soil expert Randy Dirszowsky is extracting cores from deep below the surface – timelines from the earth. The material at the bottom of the core is older, it was deposited or developed a long time ago, but as you go further, you’re getting material that has accumulated through time. Soil is made of distinct layers, appearing like stripes in the core. Over the centuries these layers build up because organic matter, like grass, decays and adds to the surface of the soil. An enormous army passing through would have left traces which can now be found. If anything were to happen on this surface it would essentially be recorded in the layer. If there is a disturbance of some kind you can likely recognise it. If the team find proof that Hannibal crossed the Alps via the Col de la Traversette – by far the hardest and highest route – it will confirm that Hannibal led his army on an almost impossible journey. But Carthage was a powerful seafaring nation, positioned exceptionally well in the heart of the Mediterranean. Why didn’t Hannibal simply go by sea? In 218BC the Carthaginian navy was weakened. And the Romans had the superior navy in terms of number of war boats; they were able to obtain big victories on the Carthaginians. Plus, they occupied Sicily, Corsica, Sardinia, which was an obstacle for Hannibal who had not enough boats to carry 90,000 men to reach Italy. If Hannibal had been forced to engage with Roman armies at sea, he wouldn’t have stood a chance. Also, he would have been denied the use of his most famous and terrifying weapon– the war elephants. Tori Herridge, an expert in ancient elephants, is on a mission to find out more about them. The thought of Hannibal bringing 37 elephants over the Alps is ridiculous, it seems completely impossible. But he did it, so the question becomes how did he do it and why? 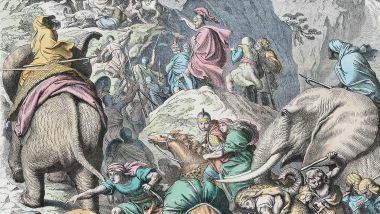 Taking the elephants across the Alps was one of Hannibal’s biggest challenges, so he must have had very good reasons to bring them along. Military historian Mike Loades has a relic from the Carthaginian Empire that might provide an answer. This is an exquisite coin and it dates to Hannibal’s period. In fact this is Hannibal’s father, Hamilcar. And on the back we have an elephant. And the fact we’ve got it on this coin tells us that elephants were deeply rooted in Carthaginian culture. We cannot think of Hannibal without the association with elephants but actually war elephants weren’t new with Hannibal. Kings of India were using them for centuries before they got to Carthage. The Carthaginians were actually quite late to the game. How do you think he would have used the elephants in battle? There’s been debate. Did they have war elephants with a howdah, that’s that sort of wooden castle construction on the back? If you have that then you’ve got archers and missile men with javelins throwing down. But if you haven’t got that then the elephant is being used as an intimidating charging machine to smash into the ranks of the Romans. A single rider and the elephant itself is the weapon. The coin might also tell us about the nature of Hannibal’s elephants. From ancient times and even right up until the 20th century, elephants used in war were mainly the Asian species, but Tori has spotted something unusual. What you can immediately see from looking at it is you’ve got an African elephant on the back. All the features are there; look at the shape of that ear, not only is it really large but it’s nice and rounded. And look here, can you see the back, it’s got this nice little dip in it, that saddle in the back. The shape of the spine of an African elephant has a sort of dip in it, whereas an Asian elephant kind of goes curved like that. Today African elephants are only found south of the Sahara desert, but historical records don’t mention Carthaginians travelling so far to get them. So Hannibal must have had native elephants closer to home. The Carthaginians seem to get their elephants from the Atlas mountains. But what we have now is a situation in North Africa where we have no elephants whatsoever. You’ve only got to go back about 6000 years, actually a bit less, before you get to a situation where the Sahara wasn’t quite as inhospitable as it is now. So it could be that there’s a historical population of elephants that stretched all the way up to the north coast. And then as the Sahara dried out from about 6000 years ago onwards, then you ended up with a remnant population up in the north that was the Carthaginian elephant. The team are in the Alps searching for evidence of Hannibal’s army. But this is not their first field trip. Back in 2015 they focused their search in France in a large boggy area below the Col de la Traversette, known as the ‘French mire’ - another place where Hannibal might have rested his troops. Since I was certain that we had the right route that was the place to start looking. The French mire is a rare place in the mountains – a wetland where water and grass could have sustained an army. Mires are like living relics, preserving organic material exceptionally well. If they were going to find evidence anywhere, it would be here. The team dug down and removed sections of the ground. Little did they know that they were pulling up something remarkable – a layer of disturbed, churned up soil almost invisible to the untrained eye. Actually I didn’t see the churned up bed until I got back to Canada. We would expect that we would find horizontal beds okay. This is the normal process. And what stood out first was that at about 40cm, we had this massive churned up bed. Amongst the regular layers in the soil was an unexpected layer that didn’t seem to have been produced naturally. How do we get something like this? Is it an earthquake? It’s possible. Could you produce a 15cm layer? I kind of doubt that. I’d never seen anything like that; I mean this isn’t what happens. Something had to disturb it that was my thinking. Something in history – something big - came through this mountain pass and devastated the ground. The team hoped it was Hannibal’s army, but further tests were needed. I’m a scientist; I don’t get too excited unless I run out of beer. Until I see the data, I’m pretty sceptical about a lot of stuff. So we went after the chemistry, the mineralogy and you might say the physical process that went on to churn that thing up. …and the results helped to resolve the puzzle. The layer contained extremely high levels of compounds normally found in horse manure. Bill enlisted the help of microbiologist Chris Allen. His challenge was to hunt for remnants of living organisms in the soil that might provide proof – not of a few local animals grazing in the Alps – but of an army of horses. The first thing to understand is that in soil there are a lot of bacteria. Now let’s imagine just over 2000 years ago Hannibal comes through here with his army, his horses start defecating everywhere. Now, there are bacteria in faeces and these bacteria are not like bacteria in soil, they live on different things. And we can see that it stands out very, very clearly. Chris analysed the whole soil core, looking at which bacteria were present over the past 2000 years that might provide clues. Then he struck gold. He came across ancient traces of bacteria called Clostridia, its remnants preserved for centuries like a microscopic time capsule. The thing about Clostridia is that it’s found in lots of different organisms and lots of different environments but it’s found at really, really high levels in the horse gut and in horse manure. The Clostridia are normally found in soil, and they were present in tiny amounts in all the layers Chris looked at. But in Bill’s unusual, disturbed layer, they were sky high. If we go to either older sediments or younger sediments below that we see levels of Clostridia that are what we’d expect to normally find in soil, so less than one per cent. But at this particular point the Clostridia go to levels that are way above 12 per cent. A massive increase, it was an absolute revelation for us. I felt elated. When I saw that I thought, you know, this was beyond my belief that we captured something that great. …And when the layer was carbon dated - it was conclusive. The soil dated to 2200 years ago, in the exact time frame when Hannibal made his crossing over the Alps. We have independent strands of evidence telling us one thing, that at this point in history there were a large group of animals crossing the Alps and that that group of animals we think were part of the army that was led by Hannibal. Bill’s theory that Hannibal crossed over the Col de la Traversette is now supported by microbiological evidence. But on its own that’s not enough proof. The route also needs to match clues in the ancient accounts – like a checklist of features in the landscape – a list Bill and historian Eve MacDonald know well. People argue he took several routes but this one stands right out in my mind. It has virtually all the environmental milestones that Polybius mentioned. So when you were walking around up there you could see that this one talked to you the most about matching the sources. He had only one source of encouragement, and that was the sight of Italy, clearly spread out below. This is an important piece of evidence for us because there is in fact a clear view. A high and sheltered position where the snow lay all year round… just as Polybius said. Currently this is July and here is last winter’s snow in the middle of summer. What Hannibal’s men actually found was the descent was even more difficult. The track was narrow and the descent precipitous; if anyone strayed from the path or lost his footing, he fell from the heights to certain death. But these features can be found on several of the proposed routes – what Bill needed to find was something unique. They reached a place that was so narrow that it was impossible for the elephants or the baggage animals to move forward at all. There had been a landslide and this had been made worse by a second and more recent landslip. Confronted with this, the army now became thoroughly disheartened and demoralised once more. Polybius writes about a striking feature – a giant landslip, the biggest natural obstacle faced by Hannibal. It stopped the army dead in its tracks. This finally led me to test the Alps for the presence of a two tier rock fall described by Polybius. I figured this was the key thing. If I found the rock fall I probably have the route. His soldiers might have lost all hope, but Hannibal was determined to get his whole army across, men and animals. But how did he handle 37 elephants? Cabárceno Park in Spain is home to Europe’s largest herd of captive African elephants. Tori Herridge is meeting Chief vet Santiago Borragan Santos, who has studied their behaviour for decades. His expertise might shed light on how Hannibal’s men would have controlled these giants. This is Penny. Penny is the matriarch of the herd. She’s the boss; she’s the one who decides where the herd goes, what they do, how they behave. Every morning Santiago uses a strict protocol to release the elephants from their sleeping quarters. Holding Penny back until the last minute. When she is finally let out, the herd flock to greet her. Oh look, they’re all coming. We always let Penny out the last because, as the matriarch of the group, she is the one who dictates over the others. So we let them come out from the least dominant to the most, the ones who dominate less come out first, and the ones who dominate most come last, for that reason. To ease the work of the keepers. Instinctively the elephants would follow the matriarch. Penny coming out last means she can no longer lead the others, or trap them in all day, which has been known to happen. If we leave the elephants follow the matriarch, they’d be almost uncontrollable. It’s very important to break the structure of the group, to be able to work together with the elephants. When they were marching in an army, you have to break the group to have the human control. That’s right. The elephant is an animal that mentally considers himself superior to us, which is why it’s very important to dominate him mentally, because physically we wouldn’t be able to. She’s coming to let us know I think. Penny get away, Penny, Penny, okay, let’s go. Penny, we’re out of here. So elephants need to be separated and trained individually if humans are to have the control, and not the matriarch. But a war elephant takes a long time to train. Carthaginians would have spent even decades getting their elephants ready for the noise and chaos of battle. So they can get this elephant here to get her foot up on command. They’ve got some chains there which look very awful, ever so often resting on her leg, so that she can get used to the feel and the weight and the sound and the experience of them so that is she ever needs to be transported from here to somewhere else they can secure her in the van that she’ll move in. They’re using the gentlest of methods here, apples, and pats, and instructions; even this has the effect of some quite considerable control. As far as Hannibal’s elephants are concerned, I’m sure the techniques were not quite as gentle as this, but I bet they were really effective! But no matter how well controlled the elephants were, the landslide was still a daunting obstacle. Deep in the Alps, the team have been searching for its exact location alongside Bill’s proposed route. At the top of this huge cascade of boulders, the geologists think they have just the place. What Polybius is describing in modern terms is a slope failure of some kind. This bulge that we see beneath us is the material that would have come from that rock fall that Polybius was describing. Polybius also gives a clue that makes this location more likely to be the landslide that Hannibal encountered. It’s certain that the source that Polybius is using for this particular bit must have been an eye witness because he’s very, very specific about the distance. “A previous breaking away of the hill side carried away about one and a half stades of the face of the mountain” – about 300 metres. The 300 metres is interesting because that corresponds almost exactly to the path we’re on now. But there’s an even more important detail that Bill thinks might confirm that this is the rock fall that stopped Hannibal’s army. In Polybius and his histories, he talks specifically about the presence of a two stage rock fall, two geologic events. One, the oldest one, bringing the slabs of rock down onto the slope, and the second one covering part of that older unit, right. Discovering whether the rock fall is made up of material from two different geological events, one older and one younger, is critical. So the team are taking rock samples from different parts of the rock fall for Bill to analyse back at base. What happens to the rock is it will sit on the surface, it will undergo various interactions with the atmosphere and the biosphere. Chemistries will change; they will start to affect the mineralogy that’s in the rock. When left exposed on the mountain, the rocks develop weathering rinds, layers of distinct colour on the surface. The longer a rock is in position, the thicker the rind. Essentially people usually use this to give a relative indication of time, it’s like a clock, an imperfect one but a rough clock. Finding two different thicknesses of rinds will help confirm the rock fall has two distinct layers. Those guys have got quite nice rinds. You’ve got almost 2mm on this lot; two, two and a half, maybe three. Essentially you’ve got zero rind on the surface. So we’ve got an older group and a younger group. Perfect, that’s perfect, it fits the story exactly. Bill and the team examined over 100 rocks from the rock-fall and found that the rinds on samples from the older part were on average ten times thicker. It was conclusive proof that these rocks broke away at two different points in history. Polybius’ final clue had at last been unlocked. I examined all the routes multiple times and one of my objectives always was to look for rock fall material. The only col that carries this prime example is the Traversette. All the others are free of this, they have rock falls but an army of children could walk through most of it. Standing at 10,000 feet high, The Col de la Traversette is the most unexpected route, but also the most perilous. For the army, it would have been an almost impossible mission. Eve Macdonald has returned to the south of France to test out the route for herself. Her plan is to retrace Hannibal’s footsteps at the same time of year. Thanks to an amazing piece of astronomical evidence, we know exactly when that was. Polybius tells us that it was in or around the setting of the constellation Pleiades that Hannibal got to the summit of the pass. And if you look up at the sky tonight, you can see the moon is here and you can also see the Pleiades here, quite low in the night sky. The setting of the Pleiades occurs every year in early November. To ancient eyes this signified that snow would soon be on the mountains. And so Hannibal would have understood that winter was coming and he needed to get over the Alps as soon as possible. 18. WHY DID HANNIBAL CHOOSE THIS TIME? The decision to cross the Alps on the cusp of winter seems like madness, but he had timed his journey well. Hannibal had followed the harvest season across Europe, and in autumn the rivers were at their lowest ebb. He started his march in late spring and early summer, for weather conditions. And this was the best moment for a big army to cross the Pyrenees, southern Gaul and the Alps. Even in November, up until the mountains, the weather would have been kind. Hannibal knew this well, because he had taken the time to make some new allies. Such a big army needed supplies on the way, so contacts had been established with the local tribes to let him cross these regions, to guide him too, and at the same time to supply him with the food needed by such an army. But The Alps weren’t the only obstacle in Hannibal’s path – his first challenge was crossing the mighty river Rhone. Hannibal’s exact crossing point is unknown but clues from Polybius suggest it was somewhere between modern day Beaucaire and Orange. So Hannibal arrives at the bank of the Rhone river and realises the enormity of his task. Today it’s cold and windy, there’s a mistral blowing from the north, and you get a real sense of how rough and how difficult the crossing is going to be. The Rhone is the biggest European river emptying into the Mediterranean. Its waters are wild and unpredictable. How Hannibal managed to overcome the deadly currents and get his elephants across is nothing short of ingenious. A pier of rafts lashed two by two was built into the water and covered with earth. A pair of rafts was lashed to the end of the pier and the elephants were walked onto the rafts which were then cut free and towed across with boats. Some elephants panicked and fell off but were saved, for owing to the power and length of their trunks, they kept them above the water and breathed through them, passing through the water on their feet. The detail of the elephants using their trunks as snorkels has intrigued elephant expert Tori Herridge. Swimming with a snorkel is really difficult if it’ a long snorkel, our lungs can’t cope with the differences in pressure between the air pressure at the surface and the pressure our body is experiencing. The reason for this is that human lungs are surrounded by a soft gap, the pleural cavity, filled with fluid. But looking at a cross section of an elephant’s lungs there’s an immediate difference. On those lungs there’s no sign of a cavity at all, and that is unique among mammals, elephants don’t have a pleural cavity. Instead where that gap would be, is filled up with connective tissue. It allows them actually them to breath under water much more effectively because of this much stronger, denser tissue that’s resistant to that kind of pressure. So a description that’s just a tiny detail in Polybius actually fits perfectly with what we know of both elephant behaviour and their internal anatomy. After crossing the Rhone, Hannibal didn’t take the well-known route along the Durance river. There was a major threat to the south, in nearby Marseille. Eve and Tori are trying to understand the decisions that led him to the Col de la Traversette. His intelligence tells him that the Roman general Publius Scipio is at the city of Marseille. And the last thing Hannibal wants to do is engage with Roman armies. He has to, if he’s going to succeed in his plan, engage with the Romans in Italy. Can’t go south then because of the Romans, the only option then is to head north. One of the most likely options is the Drome River Valley, comes off the Rhone and heads up into the mountains, and then re-joins the Durance River. And there’s a place on the way where the path divides and at that place is where he makes an unexpected move. Eve and Tori have teamed up with mountain guide Damien Juhen at this pivotal fork in Hannibal’s route. Uncovering the next steps of his journey require some expert local knowledge. Damien: Here we are exactly at the confluence between the Durance river on the left and the Guil river in front of you. The Guil river is going through the gorge, really steep and narrow gorge, the Guil gorge, and the Durance is going down until the Mediterranean sea. Tori: and that’s where Hannibal would have been coming from? Eve: Yeah, and at the fork he had to make a pretty critical decision. He had to decide whether to continue up along the Durance river or he could veer off here up the Guil river and take the road less travelled, the road that no one would have expected him to take. And also the shorter route into Italy. Tori: why did he choose the road less travelled? Eve: because that’s very much his personality. He was always someone who was into surprising the enemy. But this decision proved almost fatal. Hannibal and his army soon found themselves at the bottom of wall after wall of sheer rock, towering over them. Damien: so, when Hannibal came down in the valley, you arrive and it’s like a wall, ok, and it’s really impressive… Even for me, the first time I came here it was, I was, where is the road, so I think that for him it was really hard. Eve: how long would it take to walk the gorge? Damien: Nearly a day. It takes a long time for these 20 ks of gorge. Eve: So for an army laden down with animals, in difficult conditions, it would have been more than one day walk? Damien: for sure, yeah. For sure. More than 3 days maybe. Slowly marching through the gorge put them in a very vulnerable position. And some were only too eager to take advantage of it. Eve: He runs into some locals who pretend to be friendly, so-called friendly guides, but he’s suspicious. The horses went mad with terror at the wild shouts, which echoed and re-echoed ever more loudly from the forests and mountain sides, while chance blows and wounds so panicked them that they wrought havoc among the men. You can imagine the noise, the chaos, the animals turning around, people dodging, trying to take cover; people are falling into the river. And there was no way for them to defend themselves. The tribesmen took whatever plunder they could. By the following day they had gone. Hannibal sustained huge losses, his men and animals scattered across the gorge. The horses proved to be a liability in the mountains, and their panic only made the attacks worse. But they were a crucial military weapon that Hannibal could not do without. Half of them belonged to his elite mounted force – the Numidian cavalry. The Numidians were light cavalry, they came from North Africa. They were lightly clad and famously rode without saddles and even without bridles. They used just a simple neck rope, that’s all they had. The Numidians were armed with fist-fulls of javelins – riding at the enemy and throwing their spears, time and time again. They were hit and run troops. Riding without a saddle, because it hadn’t been invented, riding without a bit, and a bridle, is challenging. Only possible on a fantastically trained horse like this. The fact that the Numidians actually went into battle like that is mind-blowing. Can’t imagine… they must have had such control, such a relationship with their horses. This horse should follow me. So without any tack, without bridles and stirrups, and all of that sort of thing, he’s silent, it’s stealthy, it’s the perfect horse for scouting. Imagine them in the Alps, if you’re going over treacherous terrain, you can get off and the horse will follow you. On Hannibal’s journey the Numidian cavalry were frequently sent ahead to gather intelligence or find routes. But there’s another skill they had to give them the element of surprise. They would lay their horses down, it’s perfectly comfortable for the horse. There he goes… Look at that. Just think how useful that is if you’re a scout, you can get really low behind the tall grasses and scout the enemy’s camp, count their numbers, then they can simply get on their horses. They were the eyes and ears of Hannibal’s invasion force. But the horses weren’t the only animals that had to endure the long march to the top of the mountain - most famous were his elephants. At the Royal Veterinary College, Professor John Hutchinson has a rather grisly piece of evidence that reveals why they are so unexpectedly well-suited for long and hazardous journeys. It is the left hind foot of an adult Asian elephant. You can see that it’s up on tip-toe, that’s really remarkable about elephants. So you can see the heel up here, that would be the ankle joint and the middle toe, the third toe, going down here, so the elephant’s up on tip toe. I Love that. The fact that you look on the outside and they look sort of straight and flat footed; then you look inside them and it’s a completely different story. It sure is. And then on the back half of the foot, there’s this massive yellowish white tissue is all fat pad, just like our heel pad on our foot but massive. When you imagine an elephant moving the mountainous areas, they might have been better off than something with a hoof. Yeah. Elephants have a foot that is able to change its shape to suit the environment. But it’s not just the structure of the foot that makes the elephants well adapted for Hannibal’s mission – they are also very economical when in motion. As we see in this video the limbs are really straight when they’re supporting the body and walking, so they’re like pillars, the elephant only flexes its joints mainly when the feet are off the ground so the muscles don’t have to exert as much force to support an elephant’s weight. Perfect for long distance travel. It is. They have a really flexible way of moving. In very steep slopes they’ll get down on their knees basically and crawl along to get up high slopes, they have that kind of stability and economy that is uniquely elephant. because of an extraordinary experiment conducted almost 60 years ago. In the summer of 1959 British engineer John Hoyte led a team of scientists and explorers on one of the most ambitious experimental archaeology events ever attempted – taking an elephant over the Alps in Hannibal’s footsteps. Sir Richard Jolly was second in command. The scientific part of our expedition was a very careful checking of Jumbo’s speed along the level and when ascending towards the summit and as high as 2083 metres. We were seeing whether the different in altitude and the climbing challenge slowed Jumbo down in any way. And the short answer was no, it didn’t. I think the elephants, they’re very sensitive creatures and if well trained are very confident and in control of themselves if you like. Yeah, and there’s Jumbo having some fun. Good ol’ Jumbo. So elephants, despite living in warmer climates, can endure the cold and Alpine terrain in short bursts. Needing to speed up the march, Hannibal loaded his pack animals with mountain rations. In his army, even the humble hard-working donkey had an essential role. Tori and Eve are attempting the final leg of his climb into Italy, going up to the Col de la Traversette, and testing out they would have coped. If you’re on a mission to be as quick, moving as fast and light as possible then you’re always going to have to trade-off between what you carry and what you collect. So the more you carry, the less time you’ve got to spend foraging. Once he starts to go up to the mountain he’s going to have to be carrying an awful lot of food because there really isn’t much capacity up here to forage. Hannibal’s donkeys would have carried about 220 pounds worth of hay, enough food to feed one horse for 20 days. The trouble is he had 9000 horses and 37 voracious elephants. There are historical records for the amount of food needed by the men and horses but for the elephants it’s not clear. One elephant would usually eat between 60 and 70 kg of fodder per day, plus about 4 kg of concentrated pellets each. Almost a ton a day for the entire herd. And they also eat the grass outside of course. Elephants are big hungry beasts. An adult elephant can consume up to 300 pounds of food in a single day, but a lot more if constantly on the march. If they have food close by they don’t do anything, in that respect they’re very clever. But obviously the more exercise they have the more food they need. As he pushed on towards the Col de la Traversette, his exhausted army would have snaked across the mountain over 20 miles. But we know from the ancient texts that while the summit was looming in sight, their food supplies ran out. The animals were nearly dead from starvation, since the high passes were almost totally devoid of vegetation and whatever fodder there might have been was buried under snow. So something had clearly gone wrong with Hannibal’s logistics. Stop there, just a second. The team encounter a problem that Hannibal must have faced himself in early November. Now we are up to 2500 metres elevation and the path has become really hard, really difficult because it’s steep, and it’s really icy, so with the donkey we can’t go through. For us it can be okay, but with the donkeys it’s impossible, for sure. When you get something like this and there’s no way you’d get a beast up there, they’d have to go ahead and hack the ice off and even then you could imagine the situation where something lost its footing and just slid. You have so many tales of it, and it’s amazing that two or three times we get this sense of these pack animals knocking people, and themselves and other horses and everything off the paths. Many pack animals must have died on these steep icy slopes. Losing any of them would have been a real concern for an army wholly dependent on the food they carried. As you lose your pack animals it’s not just the beast that’s dead, that’s 100 kg of load that you can no longer take with you, that’s 20 days of horse feed. That’s what Polybius said, by the time they get over the other side to anywhere that’s good grazing, the animals are starving. So that’s it, they’ve lost so much of their supplies just coming up dangerous routes like this. The lumbering creatures walked for nine days in the Alps, camping in the freezing cold, marching night and day. At long last, after a desolate climb, Hannibal reached the Col de la Traversette. From the high top of the mountain, the view of Italy and the prospect of conquest stretched out before him. Eve: Here we are, France on one side, Italy on the other, standing on the border. His army must be spread out all down the valley; it takes two days for everybody to come. 30,000 men and maybe 10,000 pack animals… And of course 37 elephants. Hannibal needs to make them believe that they can do what they set out to do… and he encourages his army with stories of all the riches and the wealth to be won, and all the heroic adventures that lie ahead of them. The monumental Alps, their snowy spires and craggy slopes, had met their match right here. Now, for the first time, scientific evidence is confirming the historic account; that Hannibal made the crossing at the highest and hardest pass of them all – the Col de la Traversette. Finally we are pulling together some scientific evidence that this is the route that he took across the Alps, and who would have expected that this would be coming down to something as simple and tiny as the bacteria hidden in the soil. We finally had narrowed the pass down to one place. A journey that became legendary – now seems like it was really possible. Whilst it was difficult, whilst it would have been bloody, there would have been deaths of both people and of animals, at each stage I don’t think any of these problems were insurmountable. If you’re willing to push, then why not, you can do it. Hannibal’s invasion over the Alps sent shockwaves through the ancient world. By the end of the year he had won two decisive battles on Roman soil. Carthage was safe – for now. For 15 long years he waged a campaign of annihilation throughout Italy. But eventually Rome stood strong once more – and the tide of victory turned. Hannibal was finally defeated on home soil – and Carthage was sentenced to ruin. But his incredible journey over the Alps remains a testament to his unflinching determination and military genius. This was undoubtedly the most difficult pass Hannibal could have taken and we have to ask ourselves why did he take the hardest route. And what probably drove that decision lay in what made the man who he was. Because the more difficult the journey, the more difficult his quest almost, the greater his heroic status would be. 2200 years later we’re still absolutely fascinated by Hannibal and in especially by this journey he made over the Alps. He created the myth and we still believe it. IN ASSOCIATION WITH CHANNEL 4 AND FRANCE TELEVISIONS. © 2018 THIRTEEN PRODUCTIONS LLC and LION TELEVISION LIMITED. ALL RIGHTS RESERVED.